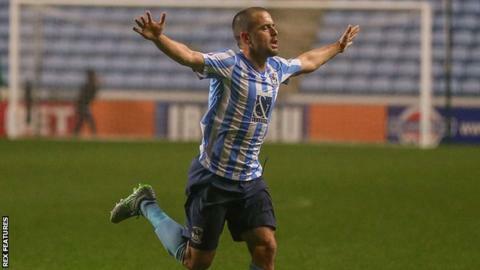 Joe Cole's first goal for Coventry City helped the Sky Blues to a thrilling victory over Barnsley in League One. Ryan Kent's solo effort put City ahead before Adam Armstrong turned in Aaron Phillips's cross to double the lead. Alfie Mawson pulled one back for the Tykes after the break, but Armstrong doubled his tally moments later. Josh Scowen's low shot gave Barnsley hope, but Cole's free-kick sealed victory, despite Scowen adding his second from the penalty spot late on. Barnsley remain 22nd after a seventh consecutive league defeat - the club's worst run since losing eight straight matches in the old Second Division in March/April 1959. Coventry stay fourth, but Tony Mowbray's men are now just a point outside the automatic promotion places. Armstrong's second brace in as many games takes his tally to 12 League One goals, making him now this season's Football League top scorer. All four Sky Blues goals were scored by Premier League loan players. The opener came from Liverpool's Ryan Kent before Newcastle United striker Adam Armstrong's double - and then the fourth from Joe Cole, who is on a 35-day loan from Aston Villa. "It's nice to get on free-kicks, as I've played with many great free-kick takers like David Beckham, Steven Gerrard and Frank Lampard and I've not taken too many in my career. "But, most importantly, we got the three points against a side that probably shouldn't be where they are. "It shows that we should be higher in the leagues. It's up to us players, management and staff to put the club in a higher position, particularly with the facilities and the city." Match ends, Coventry City 4, Barnsley 3. Second Half ends, Coventry City 4, Barnsley 3. Romain Vincelot (Coventry City) is shown the yellow card. Ben Pearson (Barnsley) is shown the yellow card. Goal! Coventry City 4, Barnsley 3. Josh Scowen (Barnsley) converts the penalty with a right footed shot to the bottom right corner. Penalty conceded by Aaron Phillips (Coventry City) with a hand ball in the penalty area. Ruben Lameiras (Coventry City) wins a free kick on the right wing. Corner, Coventry City. Conceded by Lewin Nyatanga. Attempt blocked. Marcus Tudgay (Coventry City) right footed shot from outside the box is blocked. Attempt saved. Jacob Murphy (Coventry City) right footed shot from a difficult angle on the left is saved in the top centre of the goal. Simeon Jackson (Barnsley) wins a free kick in the defensive half. Attempt blocked. Alfie Mawson (Barnsley) right footed shot from the centre of the box is blocked. Romain Vincelot (Coventry City) wins a free kick in the defensive half. Chris Stokes (Coventry City) wins a free kick on the right wing. Substitution, Barnsley. Simeon Jackson replaces Sam Winnall. Attempt blocked. Ben Pearson (Barnsley) right footed shot from the centre of the box is blocked. Foul by Marcus Tudgay (Coventry City). Lloyd Isgrove (Barnsley) wins a free kick on the left wing. Conor Wilkinson (Barnsley) wins a free kick in the defensive half. Attempt missed. John Fleck (Coventry City) left footed shot from outside the box misses to the right. Substitution, Coventry City. Marcus Tudgay replaces Ryan Kent. Attempt blocked. Sam Winnall (Barnsley) right footed shot from the right side of the box is blocked. Attempt missed. Conor Wilkinson (Barnsley) right footed shot from the centre of the box is close, but misses to the left. Corner, Barnsley. Conceded by Aaron Martin. Corner, Barnsley. Conceded by Jacob Murphy. Corner, Barnsley. Conceded by Sam Ricketts.